Happy Independence Day to our American friends! 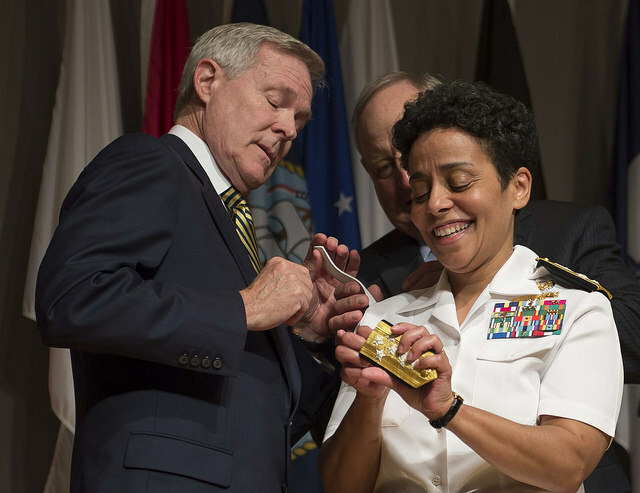 We’re kicking off today’s suggests with a celebration: congratulations to Admiral Michelle Howard who became the US Navy’s first female and African-American four-star admiral , when she was promoted earlier this week as vice chief of operations. This week Japan’s Prime Minister announced that the country’s Self Defense Forces can now come to the aid of friendly countries under attack , including the United States. This comes as part of a reinterpretation Article 9 of Japan’s constitution , which permits collective self-defence under certain conditions. But the reinterpretation didn’t go down without widespread public protest. Time’s Kirk Spitzer looks at what this change means for the country and its people . Over at The Interpreter, Hugh White argues the move to collective self-defence won’t work any better to keep Japan secure , in light of the shift in relative power between the US and China. The Diplomat’s Ankit Panda also explores whether the move could be destabilising for regional security  and further threaten China. It’s now less than a week to the Indonesian presidential election on 9 July. New Mandala continues to provide rigorous analysis, the latest of which includes this piece by Edward Aspinall and Marcus Mietzner  that throws cold water on Prabowo’s promises not to dismantle elements of Indonesia’s political system. Meanwhile, Jeffrey Winters explains the rise of Jokowi and Prabowo : one word, SBY. Lastly on Indonesia, over on East Asia Forum, Pierre Marthinus and Isadora Happy Apsari write that a military build-up will be inevitable under a new president . Moving to the South Pacific, CSIS’ Gregory Poling puts Fiji’s new forum, the Pacific Islands Development Forum (PIDF), under the microscope . He notes that other Pacific state members didn’t just join the forum because of Fiji Prime Minister Bainimarama’s dispute with Australia and New Zealand, rather, ‘they did so because his call for a more responsive, effective, and equal Pacific architecture—one encompassing civil society as well as governments—rang true’. For what that means for Australia, New Zealand and the US, keep reading here . Welcome the Australian Army to the blogosphere! The Army’s Land Power Forum  was launched this week and is ‘designed to facilitate vigorous debate and exchange of ideas about future conflicts and security challenges, capability development, the future of land forces, and the utility of land power beyond 2020’. To join the discussion, check out the submission guidelines here . Earlier this week, our cyber team wrote  that NATO’s collective defence clause, Article 5, now applies to cyberspace: a cyberattack against one means an attack against all. Over on The Bridge, Thomas Rid explains  why this will actually have an escalatory, rather than deterrent, effect. Part of the problem, he writes, is that NATO hasn’t defined what constitutes an attack and that deterrence requires more capabilities and will than NATO might have. Keep reading here . This week’s podcast links back to an earlier story about Japan’s collective self-defence. The Diplomat’s Ankit Panda, Zachary Keck and Clint Richards discuss the decision here . Let’s not freak out about ISIS , says Robert Wright in a bloggingheads.tv with Peter Beinart. They also cover Hillary Clinton’s ‘surprising cultural conservatism’ and Obama’s Iraq policy. Natalie Sambhi is an analyst at ASPI and editor of The Strategist. Image courtesy of Flickr user US Navy .